Want you kids to get more greens in their diet? Here’s a smoothie recipe that is rated a 10+ in this household, so not only does it taste great, but it’s chock-full of nutrition! I make this smoothie for the kids to have for breakfast, lunch, or just as a healthy after school snack. No matter when it gets served up, it’s devoured. This smoothie is similar my kale and spinach smoothie, but it doesn’t have the kale or the flax seed in it. I did try to sneak in some flax seed one day, but the kids noticed and didn’t like it. Oh well, I should be thankful that they love this smoothie though! BTW, this just isn’t a smoothie for kids, I drink this all the time after the gym for a quick and healthy pick me up! I just toss 2 tablespoons of flaxseed into my smoothie! 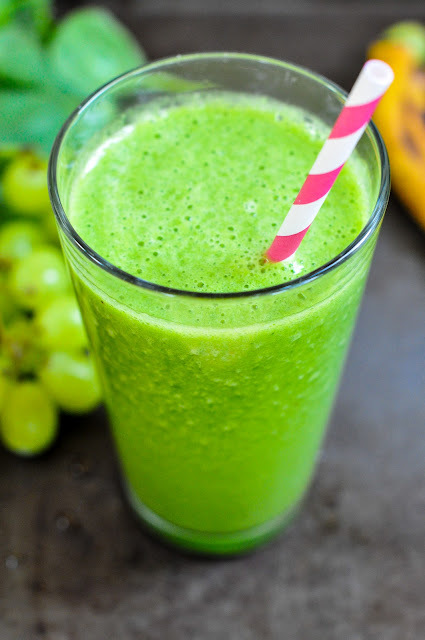 Place the water, pineapple, grapes, spinach and 1/2 banana into a a high powered blender. Pour into a glass, add a cute straw and drink up! See, my kids are really drinking it and loving it. By the way, I did not instruct them to pose for this picture! 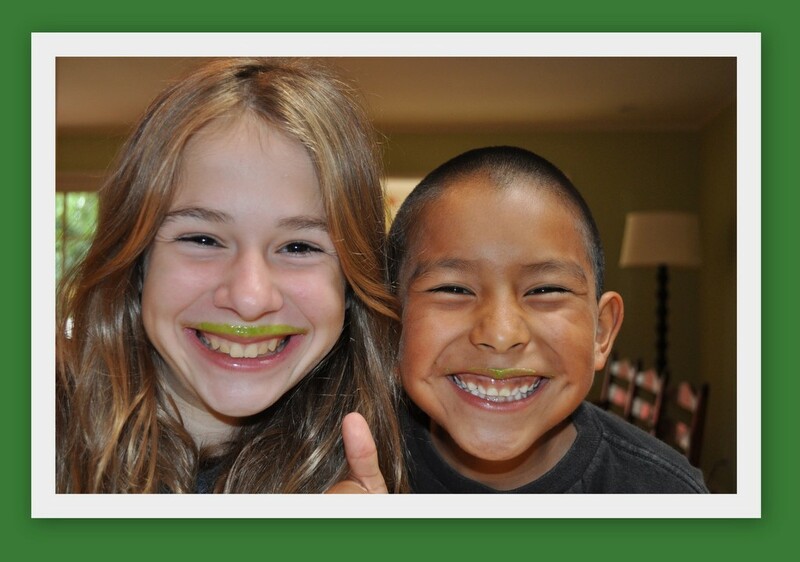 A smoothie mustache is the sign of a good smoothie, wouldn’t you agree? My kids also love these smoothies! Place the water, pineapple, grapes, spinach and ½ banana into a a high powered blender. just gave this one a whirl and down the hatch – not only do they like the taste the look is so vibrant green, you can call it the hulk juice no problem 🙂 thanks! This smoothie is delicious. I used frozen organic spinach so I have no idea if I got the quantity right but tasty. Yaay Catherine! I’m so happy you loved the smoothie 🙂 I never really measure out my spinach either, I just throw in a bunch! You’ve turned me and my kids onto spinach smoothies! I really expected them to taste, well, more spinachy, but the fruit does the trick. In all honesty, I didn’t tell them until after they asked for seconds what made it green. I’ve been experimenting and they’re a great way to get what we all need into our diets on the fly. Thanks for sharing! I’m loving your recipes. Hi Erin! 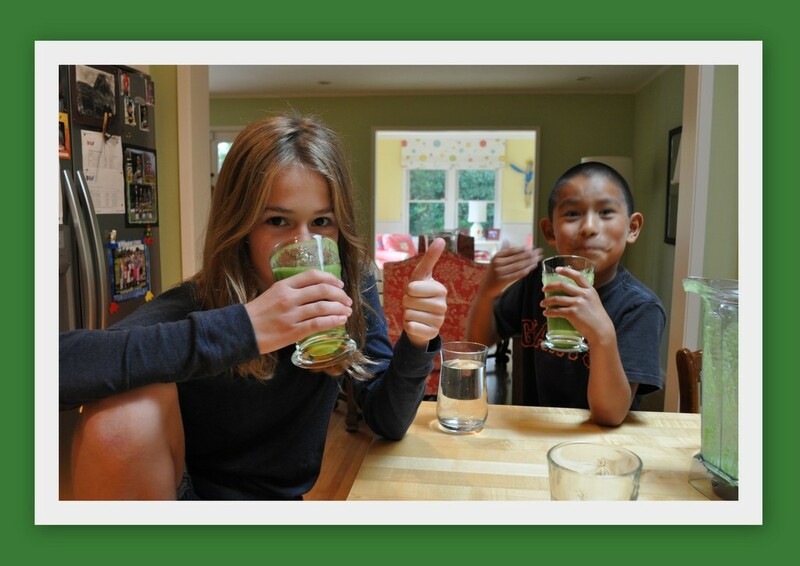 I am so glad to hear that your kids loved the spinach smoothie! Yaay! It’s so nice when you can get your kids to eat their veggies and actually enjoy it! Let me know if you come up with any other smoothie ideas! I can’t get over that your kids will drink a spinach smoothie…that is impressive…for me to get a shot like that I would have had to paint it on my kids…seriously!! !